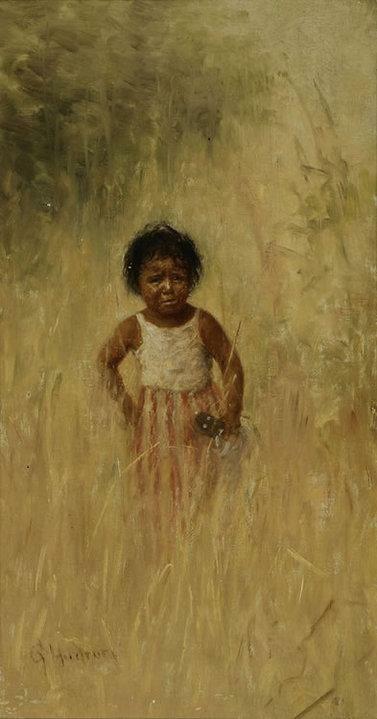 This painting by G. Hudson of a Indian Girl with Kachina is 14×8 inch oil on canvas. It is part of the Farhat Art Museum fine art collection of American Indian. Grace Hudson was born, lived most of her life, and died in Potter Valley, near Ukiah, California. The daughter of a newspaperman and photographer, she became interested in Native Americans as a young girl, and this was to become her specialty as an adult artist. At age 14, Hudson left Potter Valley to study at the School of Design in San Francisco with Virgil Williams, Raymond Yelland, Domenico Tojetti, and Oscar Kunath. Upon completion of her studies in 1884, she returned to the Ukiah area where she began teaching painting. Five years later she opened her own studio. Never has Photo Realism turned to subject matter quite as evanescent as a bubble; generally such work focuses on solid, relatively enduring objects such as cars, cosmetics, shop windows, or furnished interiors. Ken Waterstreet works from photographs and slides; thus his soap bubble images are vastly enlarged. Since most of us never get a chance to see a bubble before it bursts, Waterstreet’s clusters of bubbles, by revealing their organic shapes and structures, introduce a new world of vision. His paintings raise the question of whether this is indeed the way bubbles look, for Waterstreet’s paintings with their planetary globules of color and floating color bars produce a vocabulary of images as abstract as any Kandinsky. The colors are hot, bright acrylic hues: greens, blues, oranges. Thus Bubbles #1 introduces us to a cosmology, a universe, that is only faintly familiar but remarkable in itself. Ken Waterstreet pursues photo-realism in his own manner. He brings the camera very close to his subject matter. Waterstreet’s subject is bubbles, presumably soap bubbles, which come out in his paintings looking like vast, irregular domes. These transparent shapes are loaded with reflections and surrounded by glittering froth. Most photo-realists depart from their sources in applying color. Some even work from black and white prints. Waterstreet’s color is extreme. It belongs hardly at all to photography. He draws it chiefly from high-keyed, acrylic abstraction of recent years. His favorites are garish oranges, reds, and magentas. This palette, along with the fact that his images are arbitrarily cropped expanses of much larger ones, brings up the relationship of his paintings to abstract painting in general. One recognizes immediately the subject of Waterstreet’s works, yet it is easier here than in the case of any other photo-realist works to read representation as abstraction. Waterstreet’s bubbles are so oddly tinted, so outrageously enlarged and ultimately so uninteresting in themselves, that one begins to ignore their referent. Thus Waterstreet has shown how to put a sharp turn in the seemingly straight line of photo-realism’s development. He has made the style veer off in the direction of all that it seemed, by its nature, to oppose. This is a theoretical consideration of a sort. It is here that the interest of Waterstreet’s painting lies.